Dance as disaster movie: crashes, bangs - and a bit of whimpering. To tackle the geological formation of Planet Earth in choreography is brave and foolhardy, so hats off to what Motionhouse achieve in Broken, a mix of dance, video and circus that starts with the Big Bang and ends with an almighty crash. Actually, the bang made me whimper a bit. Lights twinkle on a floating form (spinning galaxy? cosmic jellyfish? ), which turns out to be a dancer’s skirt, before a computer animation of exploding shapes condenses into simulations of rolling rocks and blasting geysers, while the six dancers attempt – I’m guessing – to echo these fissures and fusions. Choreographically, it strains for effect, and the music, as too often in the piece, settles for thumpy crescendos. The next scene is also a little lumpen, its stretched story of trapped miners visited by angels of hope (more twinkly jellyfish women) relying heavily on audiovisual effect. But things really get off the ground as the dancers begin to merge with the whizzy, computer-game graphics and make the most of the circus-like set, with poles to spin around, bars to vault through and ropes to swing from. 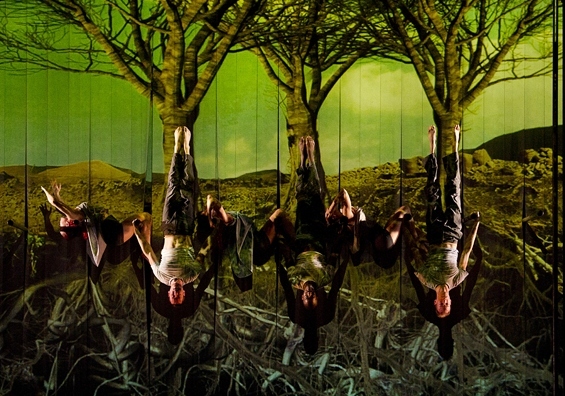 The fierce, fearless performers portray roots breaking rocks, and dive horizontally through a fiery backcloth like eruptions of lava, while a cave woman is spooked by shadowy figures and stalked by a giant on stilts, like some primal fear. The finale delivers more thrills. A modern couple in a high-rise (you need to do a lot of mental time-travelling) are caught in an earthquake. Against visions of teetering buildings and tumbling masonry, the dancers leap from ledges, dangle from ropes and slide off tilting planks to a score of sonic booms and splintering glass, until this apocalypse sees the return of the cosmic jellyfish angel woman. Broken is like a multimedia disaster movie: there are no earth-shattering insights, some parts are boring and it can be corny as hell – but when the kicks come, it’s a blast. Take popcorn.